Technology is at its most compelling when it taps into a primal, emotional need – the need to communicate with loved ones, say, or create a record of our memories. 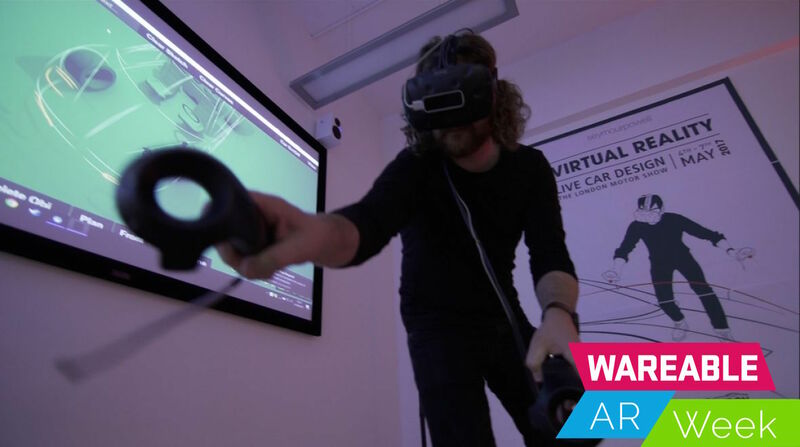 Richard Seale, lead automotive designer at Seymourpowell, a London-based design and innovation company, is enthusiastic about his new virtual reality tool because it captures the childlike wonder of creativity. Reality Works, a virtual reality space that Seale helped to create for Seymourpowell, is a studio in which he can draw life-size, 3D car and motorbike designs. "When I was a kid," he says, "I used to nick four wheels from my dad's garage and put them on the lawn, bend garden canes around an old sofa and pretend I'd built a car. Reality Works is kind of that process, that environment, but in virtual reality." The technology, which is compatible with all major headsets, was demoed on the HTC Vive at this year's London Motor Show. It was inspired by Google's Tilt Brush, the VR tool in which designers are able to draw in 3D. Collaborators can also dial in from anywhere in the world so that they can work on a project at once. Seale explains that Reality Works has streamlined the design process in two fundamental ways. First, it means that designers must confront the specific requirements of a project from the start. "On a piece of paper you would never mark out legal requirement for headlights, for instance," he says, "but in VR you can press a button and they're there in front of you in space. Because you've moved your headlight around to fit, you see you need to do something else to make it still look good." Second, it means that designers can better convey unusual, highly inventive concepts as wireframe models: "I've just done a concept car that is essentially a land yacht. It's a bit weird, so it's easier for people to come onboard and understand the project if they're around it." Though only "a few months" old – with no tangible, complete products – Reality Works signifies the increased use of virtual reality across the design sphere. Creative people in varied disciplines are experiencing the benefits of combining their worlds with those of others. The Canadian office interior design company DIRTT (Doing It Right This Time) is one such example. Katie Jeffery, head of environmental solutions at the firm, explains that it has long allowed clients to slip on Oculus Rift headsets to explore virtual versions of their own offices with DIRTT interiors added. In the past couple of years, though, they've also been able to use mixed reality headsets – such as Microsoft HoloLens – to stand in their real, physical offices with virtual DIRTT interiors laid over the top. "Now they can walk through their physical space and see what it would look like with a DIRTT interior - the floors, the ceilings, the cupboards," she says. "We called the software ICE because it actually melts into every BIM [building information modeling] software. That's really powerful because it means people can understand exactly what the dimensions and aesthetics of the space are going to be." Another benefit of the tech: ICE streamlines production by allowing DIRTT's four North American manufacturing bases to download and produce the designs at the push of a button. "Now you have a 3D printing sort of scenario," Jeffery says. "In two to three weeks, everything is flat-packed, shipped out and then snapped together – sort of like a big Lego set". Like Richard Seale, Jeffery claims that virtual reality beats an old-fashioned, drawn design: "You can have beautiful artists' renderings but really you have no understanding of what your exact space was going to look like." That said, the team is focused on making mixed reality available to more clients when the Microsoft Hololens becomes commercially available: "We're very much focused on the next generation, which we believe is mixed reality." These technologies don't just help clients to see what the designer intends, they can also help designers to see what the client needs. The medical world could benefit from mixed and virtual reality by offering the chance to adapt hospital wards, for instance, according to the needs of patients. This is an area that David Burgher, director of the Scottish architecture practice Aitken Turnbull, has excelled in. Burgher made headlines in February when he unveiled the Virtual Reality Empathy Platform (VREP), a tool that he created in conjunction with Glasgow-based CGI company Wireframe Immersive and the Dementia Centre, an Australian organisation that seeks to help people affected by dementia. The VREP is a virtual reality headset that enables users to view a space as if they experience the disorder, the lights dimmed, the spatial reality subtly warped. This allows designers to better equip the environments that they create for people with dementia. "A lot of behavioural difficulties among patients occur, for example, in corridors," he explains, "so now you can see that corridor lengths should be shorter, lighting levels should be three times higher and contrasts need to be much more significant. There are a number of things you would do differently that naturally you wouldn't think about until you'd gone into that space." A care home designer can therefore provide Burgher with a BIM model of their creation so that he can view it through the VREP: "We can effectively [assess] that design and give them feedback," he says. The technology has the potential to use mixed reality, too. Burgher hopes that VREP-equipped 360-degree cameras will soon explore the design of care homes that already exist: "There's a big issue with buildings as they are at the moment. Well, how do they fail? It's an interesting stat: if you look at behavioural difficulties, something like 90% of the built environment causes those behavioural difficulties. We can now compensate for that through design intervention." Burgher is certain that the combined worlds of design and mixed/ virtual reality have a bright future ahead of them. "At the moment," he says, "we're on a journey that's moving really, really quickly." It's a sentiment that Richard Seale can surely get behind, once his first virtual reality-created car hits the road.